Outline the scope of the individual research project and draw on the autoethnographic literature to indicate how the methodology will inform the investigation. In my individual research project I’d like to look into a few different angles of social media. I’m going to look at Chinese social media, in particular their equivalences to western social media platforms, and more broadly, how their social media space differs from the west’s. To do this I plan to do a few things to help myself understand the platforms, primarily this will be using an autoethnographic method in that I will personally attempt to sign up to all the leading social media platforms and document my experience, possibly even record myself at the same time. In Brad Crawford’s documentary “100 Yen: The Japanese Arcade Experience” he often makes the comparison between the ‘traditional’ arcade scene and the ‘up-and-coming console generation’. To compare my personal research project to this documentary, social media platforms in China, like Weibo, Renren and Tencent are primarily used by Chinese citizens, or at least Chinese speaking people, that is they survive, and were developed off the culture surrounding the platform. Similarly Japanese arcades were created in Japan, to entertain the Japanese people, the culture surrounding the platform has kept it active, and when the culture changes, so must the platform. – To create an informed first hand experience of the new (to me) platforms. Subsequently, I will do some data collection to help be able to compare statistical data between the different cultures. – To look into how a culturally driven service i.e. they tailor the product to the users change between vastly different cultures, cross cultural difference in standards and emphasis on communication in the case of the social media platforms. – Without actually using the platform, you can’t compare it to an adequate standard. Such a social, diverse and changing environment – would not benefit from a static research method – this point lends itself to the nature of technology and social media in general i.e. to keep up with peoples lives in ‘real time’. – Generate a personal opinion from personal use. To use a different approach to analyse the different media platforms would surely leave out important details and intricacies in how exactly the platforms are used, for what purpose they are used, and who exactly uses them. Observing such a social and culturally involved activity would not do the analysis justice when comparing it to western media which I have extensive experience in. Likewise to use purely statistical data analysis on the different social media platforms would leave out the important social differences and thus the analysis would lack a human aspect. This is why using an autoethnographic approach to the research benefits the analysis/comparison most, as it provides a means to comparing the two cultures, and opposing media platforms to a similar standard. 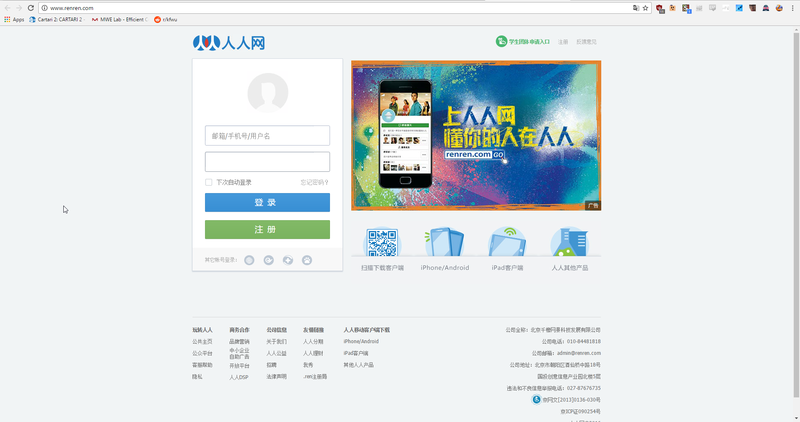 Just look at the Renren homepage, if I didn’t know any better I’d say it’s some kind of scam page out to steal my data. Crawford, B. (2016). 100 YEN: THE JAPANESE ARCADE EXPERIENCE [English subtitles]. [online] YouTube. Available at: https://www.youtube.com/watch?v=saqXPY4K-t0 [Accessed 15 Sep. 2016]. So as I wrap up my investigation of Chinese social media and my autoethnographic experience of having a Sina Weibo account, I think it’s important to discuss the usability of the site and my response to this in light of my research. To reflect on the experience, I felt it would be beneficial to explore how I went about responding to the features of the platform and how it was used by those in China, and compare this to my Australian experience of social media platforms, namely Twitter and Facebook. Initially I found the entire experience of using Sina Weibo disorientating and frustrating due to my severe lack of understanding of Mandarin, however once I looked past the language barrier I began to find aspects of the site familiar to Facebook and Twitter. As noted by Chao, the creator, he aimed to make Weibo’s interface more closely related to Facebook’s to increase its “stickiness”, meaning users would be more likely to stay on the site longer than if he decided to replicate Twitter’s interface (Epstien 2011). In my own experience, I find that I definitely spend longer on Facebook than Twitter and choose to access Twitter through the Tweetdeck app rather than the site because I feel that’s how I can get full functionality out of the platform. I felt that the functionality of Sina Weibo was much more similar to Facebook due to its sidebar, top bar, private chat feature and comment system, however I found the way people chose to use it was more closely related to my use of Twitter. Gao et al (2012) conducted a comparative study of the users’ of Sina Weibo and Twitter providing some insight into these differences between usage, however I could not find any comparison between Sina Weibo and Facebook usage despite the common description of Sina Weibo as being a hybrid version of Facebook and Twitter. One significant point of difference in usage was the time in which users of the site were most active. Gao et al found that Sina Weibo users posted 19% more messages per day on the weekend, whilst Twitter users posted 11% less messages during the weekend, which I believe aligns with my own use of Twitter and is reflective of each country’s differing lifestyles (p. 98, 2012). In terms of actual usability of the platform and its technical features, it is once again more closely related to Twitter (see Breaking The Barrier). The use of hashtags, I found on Sina Weibo to be quite annoying, however later I found out that the platform had the ability to perform ‘double hashtags’, which enables hashtags to integrate better with the text and in hindsight I now see that (Ghedin 2013). Overall, I feel like I have achieved my aim, which was to investigate Chinese social media using the methodology of creating a Sina Weibo account. Through investigating the sign up process, governance, technology and usability of Sina Weibo through an autoethnographic perspective, I feel I have learnt quite a lot about the social media use in China and am able to inform an Australian audience about this topic through a research report. Gao, Q, Abel, F, Houben, G.J & Yu, Y 2012, ‘A Comparative Study of Users’ Microblogging Behavior on SIna Weibo And Twitter’, Unknown, pp.88-101. Redmond (2013) discusses fetishism of the exotic and consuming the Other, Miike Takeshi the director of Audition is mentioned as a tester of (Western) decency. I know to some degree I have probably been involved in some exoticticising and consuming of the Other, however, through my research I seek to understand the origin of my interests and through this hopefully gather more of an idea of what it means to consume the Other. My fandom of Japanese cinema is fairly recent and not very deep, I actually have a bigger history of researching it academically than as just a naive observer, as it were. This concerns me because I think that it will impact how I view the films, in such a way that I may get caught up in analysing and then whatever I reflect may turn out to not be my genuine thoughts, but instead I would contrived them in a way that would avoid falling into the traps that I had previously read about. Watching films and discussing it with friends has been for me something that happens after the event, however, so I can get more of perhaps an honest idea of what I think of the films I will be live tweeting as I watch them. Narrowing my field of research to only Japanese horror was chosen mainly because it specifically has garnered a particularly large Western audience and I want to see if my tweets plus my research will give any indication as to why this is happening. I have not chosen the films I will be watching yet, however, in the pursuit of the extreme only those that are reviewed as indubitably scary will make the cut. It should be known that I was not always a thrill seeker of movies, mostly I liked to laugh and have thoughtful reflections, it was the study of film that brought out my desire for horror. Something about knowing more about how something is made I think makes you want to explore all the options it can offer. My method includes tweeting what I see then reflecting on these tweets and this will then all be incorporated into a storify blog. I am using this platform particularly because it will make it easier to include other media sources that may become relevant while discovering insights. I have experienced immersion I think in fandom culture once before, this was in music. Redmond (2013) talks of the director Kitano as being ‘a body-without-organs’ (p.11) and of his fluid existence in films by way refering to his celebrity identity that occupies many personas (‘grude comedian, film director, violent actor’) . It would be great if I could find out through my tweet analysis whether my identity, it being more solid than Kitano’s fluid one, was in fact able to be immersed or not. I would like to test this and watch it develop. 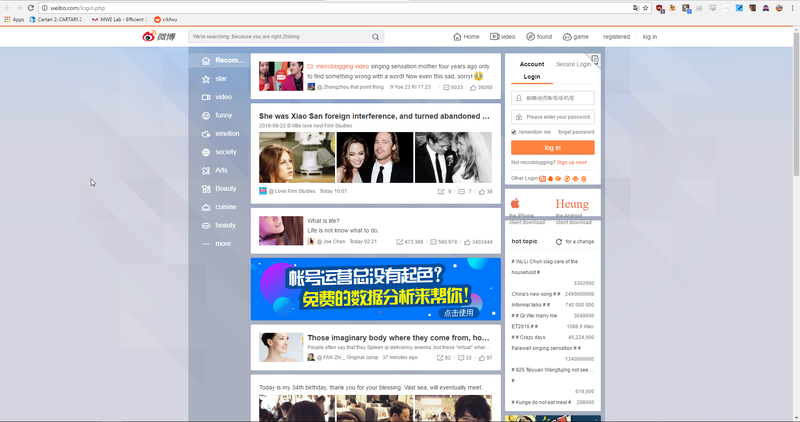 Sina Weibo is best described to a Western audience as a hybrid version of Facebook and Twitter, and over the next few weeks I set out to find out why. In my previous post, Melissa精彩, I discussed the signup process I went through to gain a Sina Weibo, this week I’m going to report back about my first week using the social networking site. One of the founding features of Twitter is its limit on how many characters you can tweet, this being 140, which is also a feature on Sina Weibo. I wrote my first weibo (which literally means microblog in English) using a translated version of the site, assuming that it would turn my English characters into simplified Chinese once posted, because of the Chinese orgins of the site, but it did not. Despite the site not translating my posts, I thought I would of received the equivalent amount of characters in English, but this was not so. 140 Chinese characters allows the user to be significantly more expressively than 140 English characters as you are not forced to abbreviate like I often am on Twitter, which implies by using English I would be significantly limiting my weibo capacity (Gao, Abel, Houben and Yu 2010). Having realised that my posts didn’t translate, I decided to explore and see if I could find any other accounts that used English, my results were negative, however I left my post in English along with my biography, which also didn’t automatically translate, to experiment. A few days later and I have received zero likes on my post, despite 59 people having read it. I also only gained 4 followers, and all the private messages I received were still in Chinese (this feature being more closely linked to the Facebook feature). Even upon discovering that there were other Australian accounts on the site, I still feel like an outsider, as they have taken to using Chinese, so this suggests I really should also. Last week I also downloaded the Sina Weibo app to my phone, presuming when I found out it was English that it may actually translate certain things. I was mistaken and the only thing it enables me to do is navigate around the app because those are the only elements in English. All notifications, posts and messages are still in Chinese, so it’s a lost cause for me use it, not knowing an ounce of Chinese. Interestingly, the partial English interface for the site only eventuated last year, whilst the app has been around since April 2011 (Custer 2013). So next week I’m going to give up attempting to use the app except to examine posts in Chinese, and try using Google Translate to translate my posts and see if that enhances my popularity and experience on Sina Weibo. I also intend to start mapping out my research report, which I have decided will be an investigation of Chinese social media through the methodology of Sina Weibo. The Yers are an alternative post-punk revival five-piece band from Thailand, formed in 2003. They are very traditional in terms of the way in which they choose to communicate with their fans and the general public using digital technologies, as well as promoting their music. The band does not have its own website, rather operating through their record label, ‘Genie Records’ which is a primarily Thai label that features the Yers. After exploring this website to get a feel for the way in which The Yers are represented online, I discovered that the website was almost identical to Western record labels online – it featured tabs for artists; blog; store; music; and news. Although the site was written in Thai, there were English translations provided for me underneath – without me having to manually change the language. I believe it to be very smart of Genie Records in doing this – it allowed them to break the language barrier that often exists between Western and Asian communities, and also gives the bands featured on the label the opportunity to be discovered by those who may be located in different areas or markets. In saying this however, the band does have an official Facebook page that is updated regularly with news, music and communications from the band, primarily written in Thai. It features essential information fans need to know, as well as shared photos and videos to get a feel for what the Yers are attempting to promote as a group. It is interesting to note that although the band is quite active in terms of Facebook use, there is little to no activity on other social media platforms, such as Twitter and Instagram. Although the band does have an official Twitter account, they have not made a tweet in over a year – this shows that they obviously prefer Facebook as their preferred method of communication with their fans and communities around the world. It would be interesting to delve into this matter further – WHY do some celebrities or groups favour some platforms over others? Is it because of the different functionalities across the varieties? This is something that I would like to explore during the progress of my personal research project into alternative Asian music artists. This week I chose to look at a few celebrities in particular and their use of online forums to post photographs. Mainly looking at Instagram and Twitter and how these are used to post, share and update followers and fans on the lives of the rich and famous. What better way to peer into the depths of the social media sites than using a #hashtag. Of course, finding the right tag is always difficult but lucky that the modern day celebrity is a hashtag expert. For this task I chose to look at Psy’s Instagram account (As chris mentioned in the lecture) and Lucy Liu’s twitter account. Both are well known and have a reasonably active presence on the sites. My experience of looking through these photos was certainly interesting. It told a bigger story than 140 characters and gave an insight into their lives that you can’t achieve through text alone. I think that age old “a picture is worth 1000 words” certainly comes into play here. I found myself becoming more engaged in the photos as it was quick, easy and usually easy to understand the context. On the flip side it also opens up a world of opportunity in regard to advertisement and product placement. From the beauty blogger posting the perfect “flat lay” with the carefully placed coffee cup in the background or the xbox controller of the popular boy and lead singer. It often include connections to other celebrities. As Chris pointed out in the lecture with Psy and his many photos with celebrities, perhaps to legitimise and gain cultural capital. I found myself overly critical when I thought any type of advertisement was taking place. Critical of the company AS WELL as the celebrity. Photos are an interesting look into celebrity culture and appear to be a great way for celebrities to engage with their fans. A quick and unofficial bit of independent research highlighted that photos seemed to be more popular on Twitter (In regards to favourites and retweets) than tweets that just involved text. I, of course won’t provide any of my data as it’s rough and was a scribbled tally on the corner of my workbook, but I think it’s the beginning of an interesting idea developing. Instagram.com, (2014). 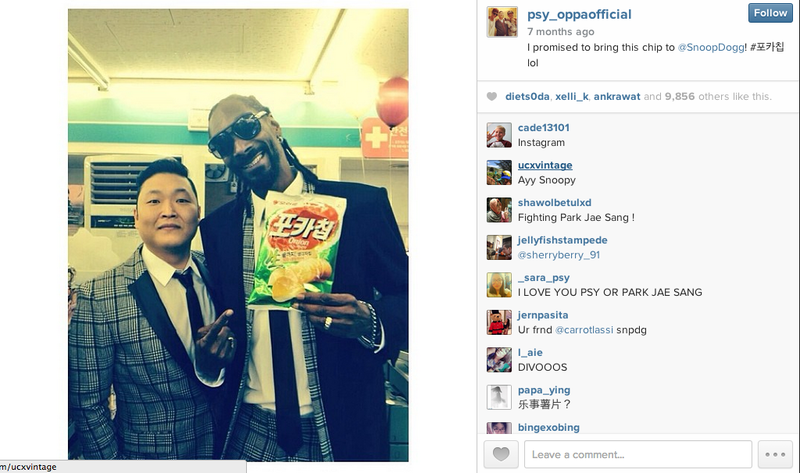 psy_oppaofficial on Instagram. 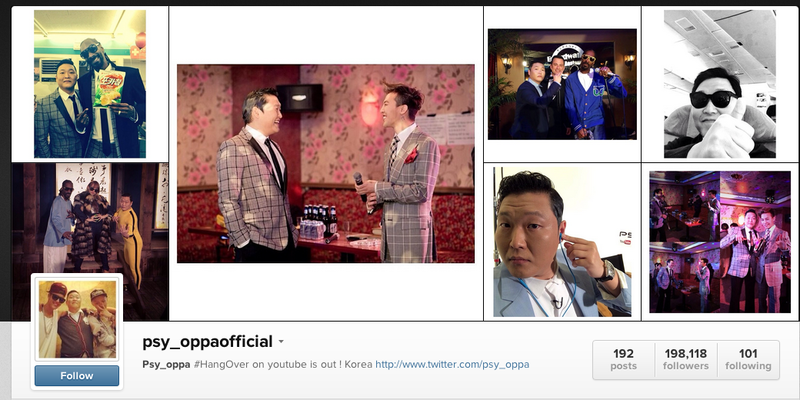 [online] Available at: http://instagram.com/psy_oppaofficial [Accessed 19 Aug. 2014]. Twitter.com, (2014). 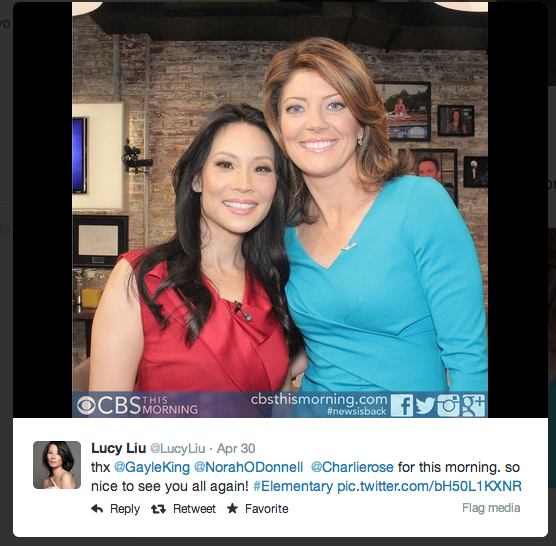 Lucy Liu (LucyLiu) on Twitter. [online] Available at: https://twitter.com/LucyLiu/media [Accessed 19 Aug. 2014]. Finding a celebrity in my current auto ethnographic focus of either Monster Hunter and social gaming was proving to be very difficult for me, largely because I speak no Asian languages (as far as I know). Seeing as I purposefully know very little about these areas (at the moment at least), I was totally unable to find a single person widely recognized in them whom I could discover anything about. 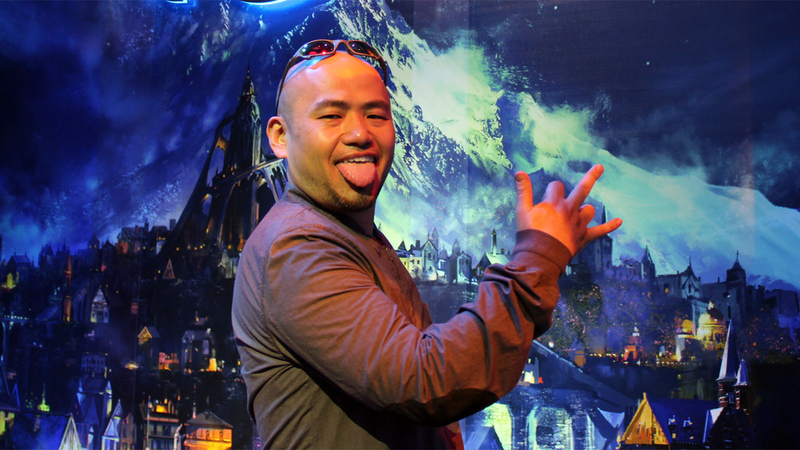 In order to compensate for my inability to stick to definite topics, I have chosen to follow the light-hearted social media presence of my favourite man of gaming, Hideki Kamiya – because that’s close enough, right? Having tweeted a whopping 119 thousand times, it is clear that Hideki uses Twitter for the purpose of interacting with and answering questions from his fans and customers, other than solely as a means of personal gain. This idea I feel is strengthened through the absence of these alternative social media, for they are not as accessible in terms of audience engagement as Twitter is.Through continual use of this site, Hideki has constructed the image of himself as light-hearted, playful and slightly bossy. As much as I love this Twitter account, I can’t help but feel like at least a small portion of it is shaped by personal biases and assumptions – for instance that Hideki speaks fluent English (or rather he does not). While I have no doubt that I love this man, I often find myself wondering how much of this opinion is flavoured by his inability to articulate our language flawlessly – let alone while being forced to shrink his words to suit Twitter’s needs.